The C&C Girls make your holiday shopping easy this year by hand selecting their top 5 gifts for the season! Be sure to enter for your chance to win each prize listed below! T by Daniel is a unique company that is dedicated to selling premium quality, loose leaf Teas and herbal infusions with an amazing array of flavours and scents. They are taking a modern touch and adding“coolness” to tea with their wild advertisements, unusual and unique flavours and new ways to bring people together to indulge in T. Flavours vary from your traditional herbal blends to more upbeat flavours such as red velvet cupcake, fuzzy peach and coffee. This Christmas Wow your loved ones with FIVE of our extraordinary, premium loose leaf teas, packaged in high quality popular and adorable reusable air-tight tins. 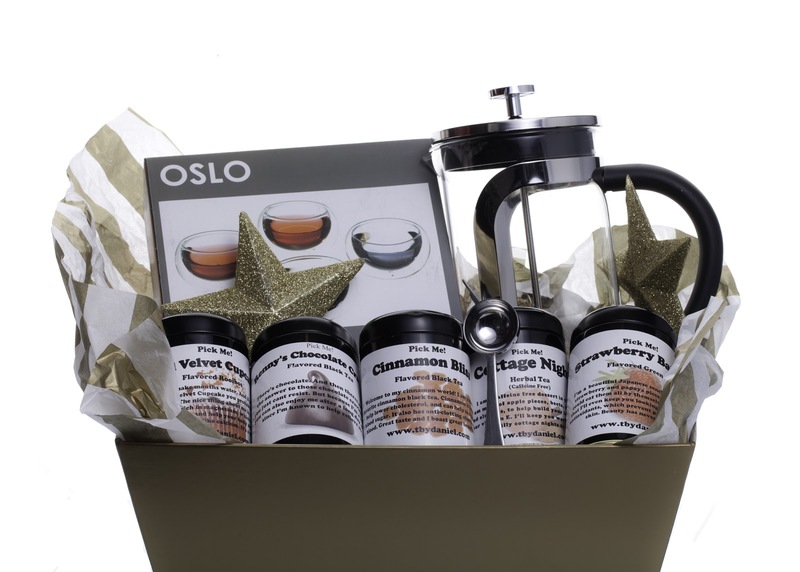 The package comes complete with a new flashy Oxford 8-cup tea press and the perfect tea spoon. This makes a great unisex present for your boss, colleagues and or family members. Email chandeliersandchampagne@gmail.com with subject line “T by Daniel” with your full mailing and contact info to win an $85.00 T by Daniel gift basket. There’s nothing better in the cold weather this winter than to cozy up by the fire with a nice glass of wine or cup of T by Daniel than in the comfort of your very own Lazypants. Based in Toronto, Lazypants was developed as an answer to consumer demand for the ultimate lounge pants. The LP motto‘Why Sweat When You Can Be Lazy’ is what Adam Bledin (creator) wants his clients to live by. The entire Lazypants collection includes original Lazypants in 18 different colours, four washes and even pockets, two Special Pride Editions, skinny Lazypants in two different fits, Lazypants hoodies in different washes and shorts in different fabrics. Lazypants is the perfect holiday gift this winter for your special someone, girlfriends, or hip and lazy family member! Email chandeliersandchampagne@gmail.com with subject line “Lazy” with your full mailing and contact info to win a pair of Lazy Pants! Holiday season is the busiest time of the year so what better gift to get a new mom than an at-home massage or personal training session. Most new moms can’t find the time to get out and enjoy a spa day so why not bring the spa to your home while the little one is napping. MFit Vitality offers personal training, lifestyle coaching and massage therapy right in your own home. Learn all about stress management and how to balance new life changes and set personal goals to improve overall health and fitness. Or just to kick back and relax and enjoy a Swedish, head, or deep tissue massage. MFit Vitality is also perfect for a girls night in and offers some amazing packages and deals to really pamper the important women in your life. Email chandeliersandchampagne@gmail.com with subject line “T by MFit” with your full mailing and contact info to win a FREE mobile massage or personal training session. Nayme (pronounced “name”) is a proud Canadian jewelry brand that specializes in sterling silver necklaces. Nayme is a perfect personalized and sentimental gift for the holiday season! Each delicate chain has a pendant on it to symbolically represent the meaning of a name. Simply type your name in on the website to find your personalized meaning for your gift. Each necklace comes beautifully wrapped in gift box detailed with a black ribbon, specifying the name, its origin, meaning and Nayme’s unique representation of that meaning. Nayme is definitely the most wanted gift of the season! Email chandeliersandchampagne@gmail.com with subject line “Nayme” with your full mailing and contact info to win a FREE personalized Nayme necklace. Looking for the perfect elegant gift for your partner’s parents or your boss/co-workers at the office? A gift set from Colaneri Winery is the perfect gift of red and white wine to suit every taste bud. Colaneri Estate Winery is a family owned and operated beautifully surround vineyard on the St. Davids Bench. Most of the wines are made in the traditional Italian appasimento method. The C&C Girls recommended mixing the red blend called “Insieme” paired with the white win blend called “Allegria”. The red blend is a combination of Cabernet Sauvignon, Syrah, Merlot, Cabernet Franc and Peit Verdot best paired with red meats and all things chocolate! The white is a beautiful blend made in the appassimento style with a faint hue of caper. This is best paired with a pasta/antipasto or sea food dish. Email chandeliersandchampagne@gmail.com with subject line “Colaneri” with your full mailing and contact info to win a Red and White wine set!